What is cool? Am I cool? Should that concern me? Does it matter anymore? I am a man in his 40s with two sprogs, a mortgage and incurable middle age spread. Not cool. Maybe that is irrelevant, if your attitude and outlook on life has evolved little since you were 17 years old. Oh...that’s cool. I am from Essex, a county bathed in ironic “naff” cool. I live in “posh” Surrey. Not cool. I have a pet. Cool. A budgerigar. Very not cool. My taste in music...I think that’s cool. This morning I listened to SOPHIE, My Bloody Valentine and David Axelrod. Cool. Cool. Cool. Oops. I did listen to the mid-eighties, sub-Carpenters, intergalactic cheese-fest that is Clouds Across the Moon by The Rah Band. That cancels out those three “cools”. (But I still love it.) I am wearing a Kate Bush concert t-shirt and my new Onitsuka Tiger limited edition Mexico trainers. I think that’s cool. My socks are three-for-two from M&S. Not cool. But comfy. I will tell you what cool is... I’ve seen it. I’ve stood next to it. I was looking for some New Balance trainers (no longer cool) in a Harajuku backstreet (cool) when out the corner of my eye I spotted Andre 3000 from Outkast. He was on his own, just browsing for trainers, just like me. But unlike me, he radiated coolness. Ice cold. I walked closer so that I could absorb his nonchalant coolness. Should I speak to him? Should I let him know that B.O.B. is one of the coolest songs of all time? No, that would not be cool. I say nothing. I act disinterested and cool. He walks out, and two Japanese teenagers spot him, shriek and engage in polite conversation. I watch on enviously as Mr. 3000 poses for a selfie with his new Japanese friends. “Not cool,” I think to myself. I will tell you what is cool. Lyle’s – in cool Shoreditch in cool East London in the cool Tea Building. I am freezing cold by the time I walk inside because I have passed so many cool people all with beards, multiple tattoos and multi-warhead piercings. 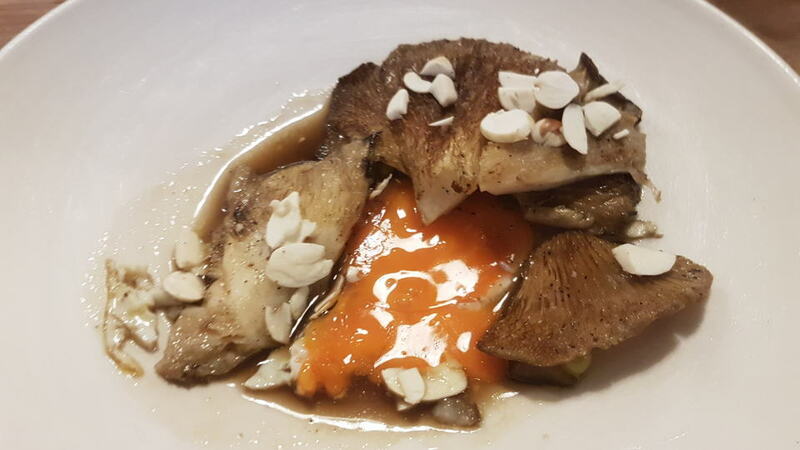 With the capital’s restaurant scene buzzing, I wanted a cool Vinous Table but the trouble is, hip ‘n trendy restaurants usually fall flat on their face in the one department that really matters – the food. Would Lyle’s be the same? I took a seat at the bar first. I must comment that the music was too loud and sounded like guitar-drone specialists Spacemen 3 played at the wrong speed. I have to say if I was eating at that moment then I would have asked them to change the music. Maybe, The Rah Band’s Clouds Across the Moon? No, maybe that would be worse. We began with appetizers. 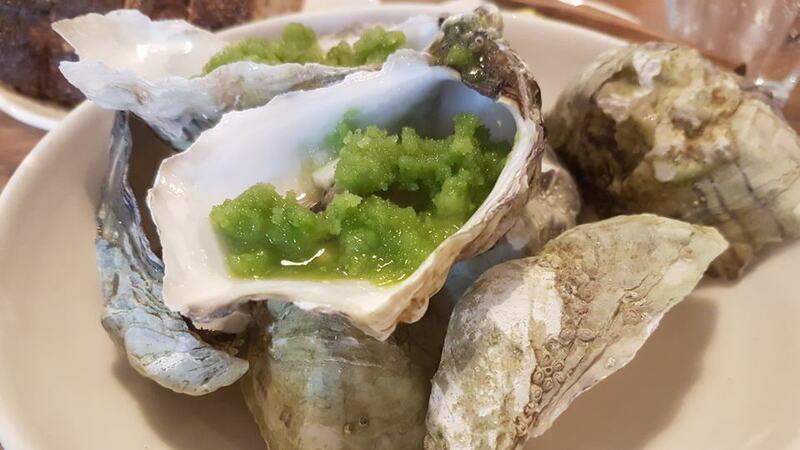 Firstly, a Jersey rock oyster with a green apple and sorrel infused crushed ice that woke up the senses. It came in what appeared to be a bowl of half-a-dozen, but sadly underneath the two, the shells were just for decoration. This was accompanied by sweet corn dripping in honey butter and lemon thyme, the honey thanks to busy local bees. Maybe, I would have liked the sweet corn just a touch softer, but otherwise it was a clever combination. My pick of the appetizers was the grilled peach hidden underneath a thick slice of lardo. The warmth and sweetness of the peach beautifully matched lardo – again, a novel combination that worked supremely well. The starter was a bowl of fermented field mushrooms and egg yolk. Warm and autumnal, the fungi were loaded with flavor and once mixed with the egg, you were onto a winner. It just oozed loveliness. 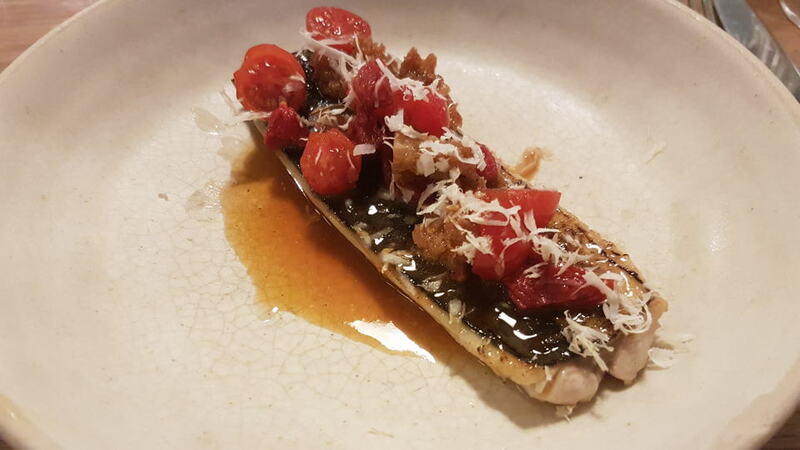 This was followed by grilled mackerel with vine tomatoes and horseradish, the fish perfectly cooked with that crispy skin we all know and love, the tomatoes tiny and succulent, the horseradish discrete when it could have easily overwhelmed the subtle flavors. Not only was this delicious but it felt light and healthy. 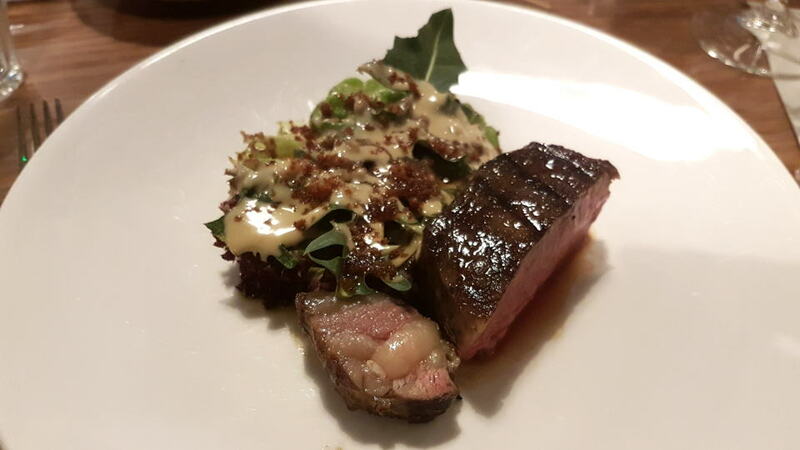 For my main, I had the Dexter sirloin with lettuce and anchovy. Now, infusing anchovy is a cooking secret that I picked up in Burgundy when I enquired why my host’s leg of lamb was so flippin’ delicious. Anchovies. Thereafter I learned that many chefs add a little anchovy to enhance their meat dishes and as an aside, I’ve used it with chicken and it works just as well. The sirloin was one of the best I have eaten, not large in size, but pink, tender and, thanks to the anchovies, perfectly seasoned. The salad was also extremely well-dressed and its sharpness neatly offset the steak. To finish, pudding was blackcurrant leaf ice cream with blackcurrants underneath. Granted, this dish does not demand the most skilled level of cooking, but I had no complaints and the ice cream avoided the heaviness that some desserts can induce. Goo-ey almond cakes with a raspberry coulis completed a really quite delicious meal. In terms of the wines, the list is small, whites on one side of an A4 and the reds on the other. Lyle’s mostly eschews the classic regions and major growers, but the fermented grape juice seemed to be well chosen, with many options available by the glass. Incidentally, I did enquire about the selection to, what I thought might be the sommelier. “Oh, we don’t have a sommelier,” the waiter replied, as if there was one but had recently been shot out the back. “The entire staff is trained to a reasonable level.” In other words: sommeliers = not cool. I was actually able to bring a couple of bottles of my own. The 2015 Chassagne-Montrachet Les Caillerets 1er Cru from one of my favorite growers, Domaine Marc Colin, is slightly honeyed on the nose, conveying the richness of that growing season with hints of white chocolate and shaved almond. Whilst there is a slight heaviness on the palate, that is counterbalanced by a fine line of acidity and a persistent finish. I might be inclined to give it just another year in bottle. The red came from another of my favorite growers, Domaine Heresztyn-Mazzini, a producer reborn in recent years. The 2013 Gevrey-Chambertin La Perrière 1er Cru is sourced from a rather overlooked recent vintage and possibly also an overlooked vineyard. There is a modicum of rusticity on the nose, but some lovely, quite tertiary black fruit; certainly the aromatics open for business, with forest floor notes emerging. The palate is well balanced and, perhaps, a little straightforward, with good weight towards the mellow finish. You can broach this now or drink it over the next six or seven years. There is nothing flamboyant or daring about Lyle’s – this is not a restaurant that specializes in fancy foams or ingredients that you have to Google first. 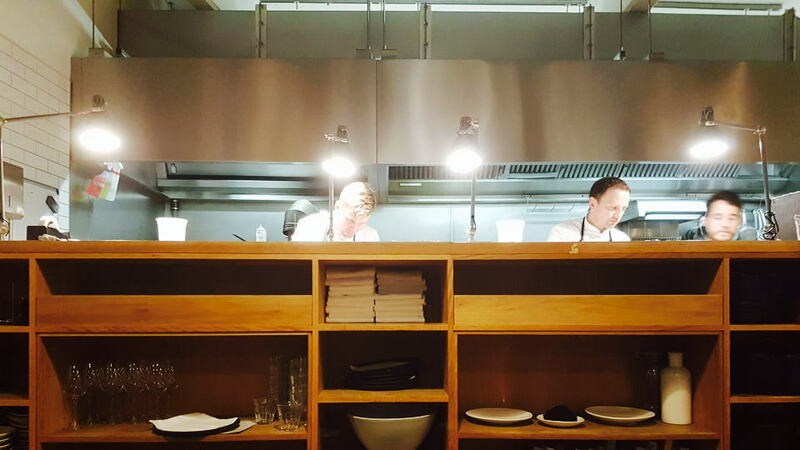 There is a lightness of touch that I really appreciate, a deceiving simplicity to the dishes that were all beautifully presented and cooked to perfection, which is what I would expect if there is a set menu. Where they do try something different, such as the peach and lardo, it all comes off naturally, as if it were something you would eat every day. Maybe, I wish there was some choice on offer for dinner. Then again, maybe it means I don’t have to worry about choosing the wrong dish. Lyle’s might be one of the coolest restaurants you will visit this year, but fortunately with the talent in the kitchen, it delivers on the plate. Yeah, Lyle’s is cool. All it needs now is for Andre 3000 to dine there with Clouds Across the Moon playing in the background.